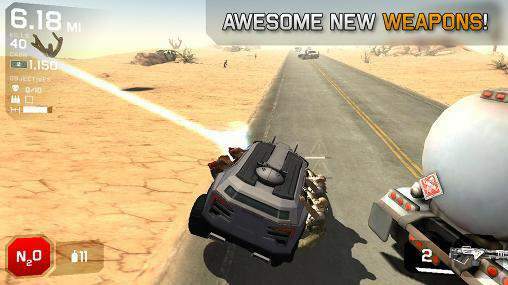 Download Zombie Highway 2 APK latest version for Android devices. 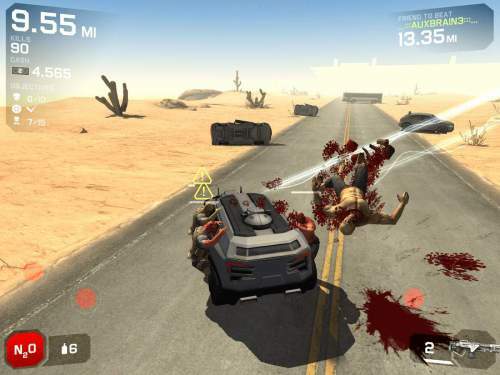 It is a free action game for Android developed and offered by Auxbrain Inc.
Zombie Highway 2 is an endless running game in the action genre which is a sequel to Zombie Highway. 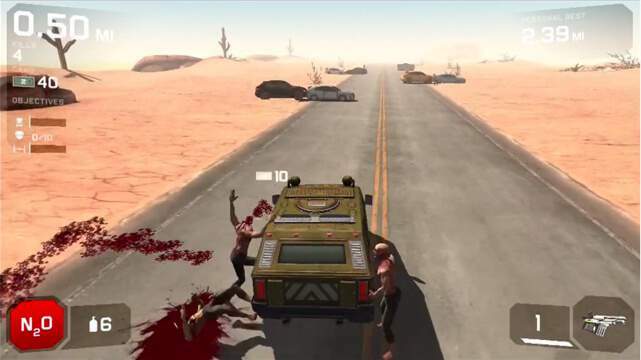 In this game, you will have to drive a car and escape the city by smashing the zombies that come on your way. In Zombie Highway 2, your goal is to go as far as possible by ramming over the zombies and killing them. This game has many improvements from its prequel with better graphics, gameplay and different challenging missions. You can select from the half a dozen powerful vehicles to drive it into the highway. Shoot the zombies from the windows of your car. Try to take a good shot to put them down. The gameplay and controls for this Zombie Highway 2 game are very simple. Move the vehicle with the accelerometer shown on the screen and press virtual buttons to do shooting or activating turbos. The highway is endless and you can drive the vehicle on more than 50 missions. In this game, you'll encounter a unique challenge daily. You'll see your friends on the highway near their best score. Avoid obstacles while trying to run the zombies down before they can jump on your car. You can have different weapons such as handguns, shotguns, automatics, and many more. The good thing about this game is that all the upgrades can be unlocked easily without requiring you to purchase them. Drive powerful cars and smash zombies. Go as far as you can and reach the high score. While smashing, shoot them with weapons to kill them. 6 redesigned cars and18 upgradable weapons. Different zombie types in 67 challenging missions. A unique challenge daily for rewards. The goal is to survive while going as far as possible. Kill zombies before they flip your car. Great Graphics with fun and challenging gameplay. Click on the below button to start downloading the APK file of Zombie Highway 2 game latest version for Android device.